We've combined stylish comfort and classic design to get the Preston Club Chair from Moe's Home Collection. Generously padded with fire resistant foam cushioning, this decorative chair is upholstered with a deep brown top grain leather that has been distressed for a timeless look. This arm chair boasts an aluminum strip at the base with nail head embellishments, making it perfect for a corner of your bedroom or next to the bookshelf in your den. The solid wood frame, curved back and sturdy tapered legs provide the stability you need. 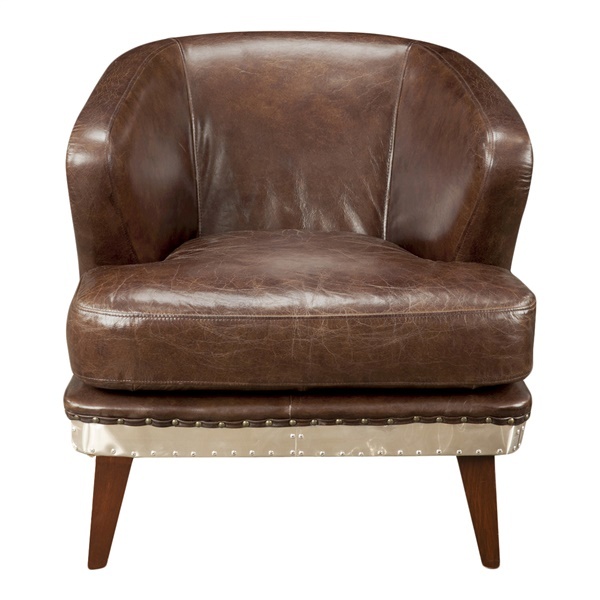 Get the retro look when you choose Moe's Preston Club Chair.